Context: Attention deficit hyperactivity disorder (ADHD) commonly occurs in patients with bipolar affective disorder (BPAD). However, there is a paucity of data concerning the prevalence of adult ADHD in BPAD from India. Aims: Attention deficit hyperactivity disorder (ADHD) commonly occurs in patients with bipolar affective disorder (BPAD). However, there is a paucity of data concerning the prevalence of adult ADHD in BPAD from India. Hence, this study aimed to find out the prevalence of adult ADHD in bipolar disorder for better diagnosis and management and tried to find association with clinical and sociodemographic features. 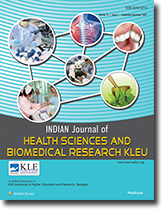 Settings and Design: The present 1 year cross-sectional study was conducted in the Department of Psychiatry, KLES Dr. Prabhakar Kore Hospital and Medical Research Centre, Belagavi from January 1, 2014, to December 31, 2014. Subjects and Methods: A total of 100 patients with diagnosis of BPAD were evaluated for the presence of ADHD. Statistical analysis was done using Epi Info 7 software. Statistical Analysis Used: The data obtained was coded and entered and analyzed using Epi Info 7. Results: Most of the patients were male (64%) and male:female ratio was 1.77:1. The mean age was 37.36 ± 11.02 years and most common age group was 31–40 years (38%). The place of residence was urban area in 53% of the patients, and 72% were Hindus. Education up to secondary schooling was noted in 63% of the patients, and 63% were unemployed. Forty-four percent of the patients belonged Class I socioeconomic status. History of other psychiatric comorbidities was noted in 55% patients, and most of the patients had alcohol dependence syndrome (23%). Conclusions: The frequency of ADHD in patients with BPAD was 15%. The most common clinical presentation was difficulty in memory/concentration and failure to finish the work, difficulty in organization, avoiding tasks requiring sustained mental effort, forgetfulness, and easily distracted were common signs. A 32-year-old female was admitted with Organophosphorus (OP) poisoning and was managed with gastric lavage, intravenous pralidoxime, and atropine. On the 3rd day, she developed swelling and pain in the right upper extremity. Color Doppler confirmed upper extremity deep venous thrombosis (DVT). In addition to the neurologic manifestations patients of OP poisoning patients should also be monitored carefully for the development of DVT as these agents can lead to persistent inflammatory response which increases the risk of DVT. Upper limb DVT is rare and generally secondary to cancer, strenuous exercise, and insertion of central venous catheters. We hereby report a rare case of the upper limb DVT following OP poisoning. Background: A proton pump inhibitor is an acid labile drug which degrades at stomach pH 1.2. Delayed release pellets were prepared to stabilize the formulation applying an enteric coat. Objective: the objective of the study was to design, formulation and evaluation of delayed release oral dosage form of proton pump inhibitor. Materials and Methods: Twelve different formulations of pellets were prepared by fluid bed technology (bottom spray technique) using different polymers for different coating processes namely seal coat (HPMC); drug coat (HPMC); barrier coat (Ethyl cellulose) and enteric coat (HPMC Phthalate). The formulated pellets were evaluated. Results: FTIR studies revealed that there was no physic-chemical interaction between drug and excipients. Micromeritic property study for pellets revealed that the values were within the permissible limits. The pellets were filled into the capsules and evaluated for drug content, %loss on drying, weight variation and in vitro dissolution. Conclusion: The filled weight of the capsule was in the pharmacopeail limits, the 5 drug content of all the formulation was fund to be in the range of 97-99 % and the % LOD was less that 35. F1-F12 formulations exhibited a release in a range of 60-90.37% in 45 min at PH 6.8.Optimized Formulation F10 Exhibited maximum release of 90.37% in 45 min . The barrier coat of the all the formulations effectively prevented the release of the drug in the stomach. The stability study revealed that the formulation F10 was stable when stored at 30°C±2°C/65±5% RH for one month.